We are accredited to send plants to all states of Australia, except WA and the NT. We are accredited to send Hellebores to Tasmania. We do not accept orders for plants from outside of Australia. We will be accepting and processing orders on our online shop from late March until the end of October, unless sold out earlier. Varieties we have sold out of will be listed as ‘sold out’ therefore we do not substitute any varieties for orders placed via this online shop. All prices listed on this website are in Australian dollars and include GST. An informative 2 page Hellebore Growing Guide will be provided with all orders. Important: Hellebores are temperate climate plants and are not suited to parts of Australia with tropical or semi-tropical climates. We do not recommend Hellebores for coastal areas north of Newcastle in NSW. However they will grow happily in higher altitude inland regions up to and including Toowoomba in Queensland. See our ‘Growing Hellebores’ page on the website for more information. The Hellebores which we sell here are one year old seedlings supplied in 75mm tubes. Please see here for an image of what the mail order plants typically look like. Please note that the size of plants supplied may vary depending on variety and time of ordering. Under good growing conditions we would expect most of them to flower in Winter the year after purchase. 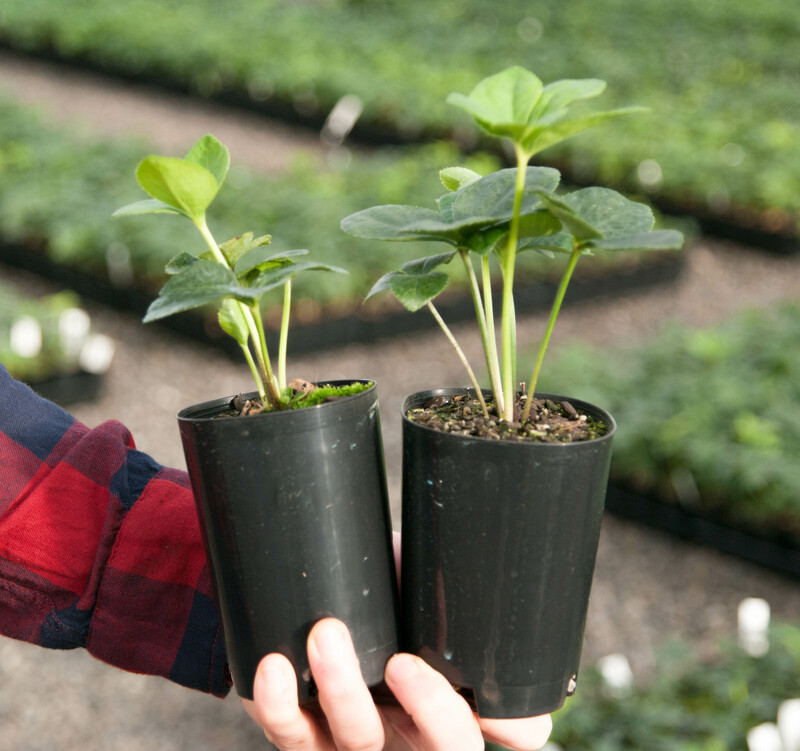 All of our Hellebores have been bred and grown by us at Post Office Farm Nursery. They have been produced by careful hand pollination (in a bee proof stock house) of the finest parent plants we have been selecting over the past 20 years. It is our experience that the combination of deliberate selection of parent plants and skilled hand pollination results in both better and more predictable offspring than with ordinary seed grown Hellebores. Our aim is to produce H. x hybridus seedling ‘strains’ with the most stable flower colour and form possible. We also select for good clear colours and round-shaped flowers. Unless otherwise stated, all photos in this catalogue are of our own plants and are intended to show what the different varieties look like, as well as showing the quality of the parent plants from which the seedlings are bred. However, as seed raised plants the seedlings will show some variability within the parameters of the ‘strain’, for example, the precise colour shade, foliage characteristics and flower shape may vary within each strain. Credit card (VISA or Mastercard only, we do accept AMEX). Our payment page is secure and uses the eWay payments gateway which is tier-one PCI DSS compliant. Please note that payments by Direct deposit may take a number of days to reach our account. We do not send plants until payment has been received. Payments by credit card are processed immediately. We use the Australia Post eParcel service to send plants. This service allows the delivery of all orders to be fully tracked. You will be advised by email when plants have been despatched and you will be able to track the progress of your delivery. Orders are usually posted on Mondays. Please let us know preferred delivery dates if you will be away. We take considerable care in preparing and packing plants for despatch. If there are any problems with the condition of plants when they are received please advise us within 24 hours of receiving the plants. We will replace any plants, at our expense, damaged during delivery. Happily we find this is a very rare occurrence. We usually dispatch orders within a week or two of receiving them. When are busy with lots of orders early in the season it may take a little longer. If you have not received your plants within 3 weeks of ordering feel free to contact us to check on progress. Please note that there is now an option to pick up your order of plants from the Nursery. This can be selected as an option when are placing your order in the shop. However you will need to phone or email to make an appointment for the pickup. We are proud of the quality of our plants and we would therefore like to provide you with a guarantee. If any plant purchased from this website does not meet your expectations either when you receive your order or when they flower we will be happy to provide a replacement plant, different plant or your money back. Just let us know.